Wait, so are Jimmy and Timmy going to actually work with Nathan and Mimsy? That would be a pretty interesting turn of events to watch! I wonder if they’re competing against some of the other kids in school in the science fair. Also, I’m very interested in seeing what the b-plot of this episode will end up being, I’m curious as to whether or not the b-plot will be building off of a previous storyline from this season. 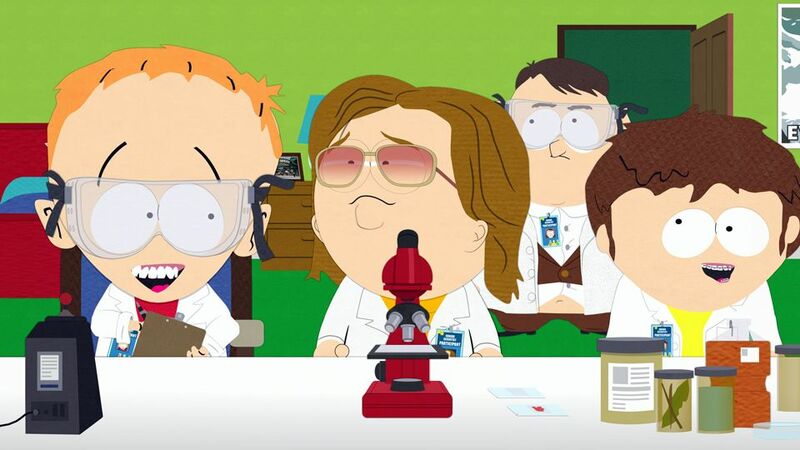 You made me think of how Cartman/Heidi will have to work together in the Science Fair with their own presentation. All I see is the show's title card. What about any of the other straight couples at school? Think they will each team up with each other for a science project? omg stop f*cking talking about the couples, man. Every single week with you it's "what about the straight couples? What about those hurt by Gerald in Season 20?" The images aren't quite big enough, but I think if you squint, the nametags will feature surnames for Nathan and Mimsy. I imagine Nathan's just setting up to work with them so he can somehow humiliate Jimmy. Sabotage the project to make them lose, or to somehow kill Jimmy. I wonder if it might tie into Jimmy's exploration of DNA in FBW? It's obviously part of the game (the superhero game, not FBW, lol) but it would be an interesting route. I'm curious how Mimsy will interact with Jimmy and Timmy given he wasn't in as direct proximity with those two in his previous appearances. I'm curious who else will be working with ho as well. Last time we only saw the boys, Terrance's group, and briefly, "Casey" and his dumb weed, but we didn't see who else was working together. It'll be interesting to see how stuff works out. I'm joking, guys. I promise I won't do this next week without a smoking gun. SouthAl93 wrote: What about any of the other straight couples at school? Think they will each team up with each other for a science project? I wouldn't mind seeing that as a supporting plot, but I highly doubt it'd be anyone too interesting. I think the main four boys would probably work together, and the remaining members of Craig's gang, than see any of them with their ex-girlfriends. We'd be more likely to see, like Kevin working with Red, and I'm saying that not because I ship them, but because they're such minor characters and the former has no built-in alternative, whereas Red could probably just be tossed in with some other girls, if she'd bother. Here's hoping we see some interesting combinations all the same, even if it's just animators... and if any animators are reading this, I've dropped enough hints, no? But you're right, it probably says that. Aw well. Official Description wrote: It’s time for the annual science fair in an all-new episode titled “Moss Piglets”. Jimmy and Timmy’s project has caught the attentions of some very important people. Their experiment could have far reaching implications that could save the world… and they might even win first prize in this year’s science fair. It’s time for the annual science fair in an all-new episode titled “Moss Piglets” on Wednesday, November 15 at 10:00 p.m. ET/PT on Comedy Central. I an curious of who the people that have had their attention caught are? Could we be seeing a Kim Kardashian episode as I've heard her made fun of as being a Tardigrades. If so will we see Kayne West and maybe his fam? That answers a lot of questions, huh? So, this'll probably be mostly a Jimmy, Timmy, Nathan and Mimsy affair with some of the girls on the side and not so much of the other boys. You know what? I'm cool with that. It's harder to speculate, but I'm cool with it. Shades of "Crippled Summer" or "Funnybot." 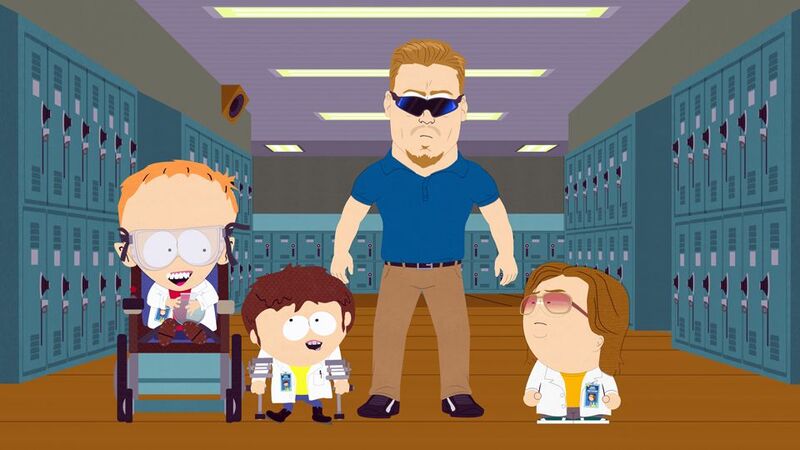 Judging by the second image, I would assume PC Principal forces Nathan to join Jimmy and Timmy. I'm just hyped to see more of the greatest South Park character ever. Judging by the clip, someone tell Nathan and Mimsy about Jimmy and Timmy's project and join them to get all the credit.